Kaos Softwear make some of the comfiest stretched ear jewellery around and their range just got a whole lot more colourful! 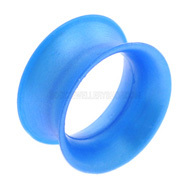 I am pleased to announce that we have fourteen brand new Kaos Softwear eyelets available from BodyJewelleryShop.com. The new silicone eyelets are just as soft and comfortable as the previous designs but include a fabulous range of colours. 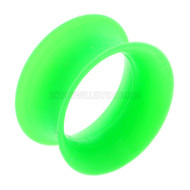 And for the first time, we have UV Kaos Softwear eyelets, perfect for all the clubbers out there. 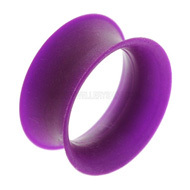 These eyelets are the thinnest, most flexible flesh tunnels you can buy. They are weightless and very comfortable to sleep in or wear under headphones. They also make your stretches look huge and give you a great choice of colours. Eight of the new silicone eyelets are from the Kaos Softwear pearl range. These eyelets have a pearlised finish that makes the colours really come alive. The pearly finish is quite subtle but it gives the colours a lovely depth and brightness. The pearl range includes nine colours: Cobalt Blue, Royal Purple, Jade, Sea Foam, Sky Blue, Sea Blue, White, Shell Pink and Hot Pink. I have the Jade eyelets and they are really gorgeous. The colour is stronger than previous Kaos eyelets and they look a little darker when they are against your skin, as opposed to the white background of our product photos. If you love bright colours and neon you’ll love the new Kaos UV eyelets. There are five colours to choose from: purple, magenta, green, orange and blue. They are extremely bright and all glow very well under UV light. 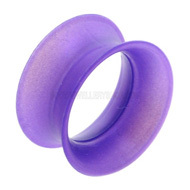 If you click on the products below you will be able to see a photo of the eyelet in UV light. Obviously they look great in day light too and the colour is less translucent than the other eyelets, so they really stand out. This entry was posted in Ear Piercings, Silicone Body Jewellery, Stretched Piercings, Stretching Jewellery and tagged Flesh Tunnel, Flesh Tunnels, kaos, kaos silicone, kaos softwear, silicone flesh plugs, silicone flesh tunnels, silicone stretching jewellery on March 30, 2011 by Piercing Guru.